The Merriam-Webster dictionary defines an interface as “the place at which independent and often unrelated systems meet and act on or communicate with each other.” In the case of humans interfacing with computer systems, interfaces have become more and more complex. This can be both good and bad with the good being derived from the vast information that can be represented to the user. The bad aspect is that the instructional designer must be cognizant of both the information available and how to present it to the user. This two pronged approach ensures that both ends of the human–computer interface are considered. The interface acts as a bridge between the human and machine and needs to act as a translator between the two. The signals generated by the machine are radically different from the images and text that the human understands. Not only is the interface required to select the necessary information but display it in formats that are optimally useful and intelligible. 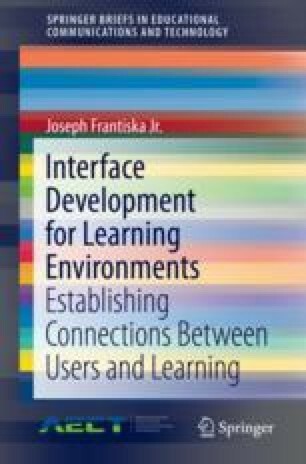 The designer needs to assess the information available and not only how to present it to the user insofar as the efficient usage of screen area but also with respect to the user’s inherent learning style and abilities. In order to do this, a structured approach that properly addresses both aspects is needed. This brief aims to fill this need.